transportation. The last being important to the wheelchair dependent. Back to baseball. First up, the Oakland Coliseum for the A's vs the Giants. Being a Seattle girl, I was uncertain who to cheer for. However, being a University of Washington graduate, I was immediately drawn to the Giants' Cy Young Award winner and UW grad, Tim Lincecum. Once a Husky, always husky, so Giants it was. Plus the A's are one of the Seattle Mariners division rivals and the M's need all the help they can get. Our crew headed down to the field to catch a little batting practice and hopefully the attention of a few all-stars. Visiting ball parks always excites me. Each one is so unique, the atmospheres electric in their own way. We watched the Giants hit bombs out of the park and enjoyed the perfect weather. 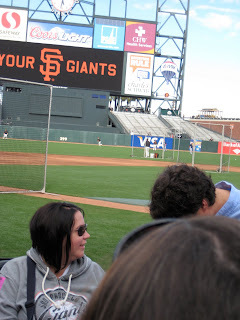 I hoped to grab Lincecum for an autograph but he had better things to do. I guess warming up for your game against your cross town rival may be a little more important. Game time was nearing to we decided to make our way up to the suite. Just our luck, Mr Lincecum was chilling in the outfield near our exit. He was kind enough to visit with us, sign autographs and take pictures. What a great guy! After our epic star filled pregame we met the real all-stars of ALS. Our two suites filled with patients, family, advocates and supporters of ALS-TDI. Being surrounded by people that are passionate about finding a treatment for a disease that makes my life hell, gives me hope and happiness. Attending sporting events and visiting with truly inspiring people gives me respite from worries about my future. Meeting other young people living with ALS helps me not to feel isolated in my neurologically challenged world. Our baseball fun did not end in Oakland. Across the bay a few days later, our crew set out to watch the Giants and Nationals at AT&T Park. I had heard from multiple people that this is one of the most beautiful parks in all of Major League Baseball. Beautiful does not do it justice. More like stunning, gorgeous or breathtaking. The hosts and Giants staff we inviting, warm and intrigued by our campaign. The weather and sunset set the perfect stage for a Giants win. To our luck, my main man, Tim Lincecum was the starting pitcher. A win was inevitable, right? Not so much. The only disappointment out of our trip was two Giant losses. The positive experiences of being surrounded by inspiring people completely outweighed the outcomes of each game. The pleasure of my trip; meeting, campaigning and dreaming about a day when the letters ALS become as obsolete as childhood chicken pox. A day when this diagnosis doesn't give the innocent a death sentence. A day when ALS becomes understood by the people who can lobby for funds for a treatment. The young men and women whose lives have been stunted by this disease deserve a chance. All men and women living with ALS deserve a chance. We owe it to all who have lost their battle to ALS to make sure that no one else perishes from this disease. Treatment is not impossible. ALS-TDI will one day prove this true and I am happy that my name will be linked to this progressive group of people. I recently participated in a video for the ALS Association and it gives you a glimpse of my thoughts as well as another brave PALS (person with ALS). You have two opportunities to help...the bike ride and the Pub Crawl. I promise it will change your life and bring a huge smile to mine.